AMD Trinity to be 20 percent faster than Llano? Newly leaked details about AMD's Trinity APU claim the chip will offer a 20 percent CPU performance boost compared to Llano, and 30 percent faster internal graphics. The chip will enter production in November and should enter volume production in January. More details at VR Zone. The CPU gets an upgrade to the latest Piledriver cores, featuring 3rd gen Turbo Core. The performance is expected to be up by 20% compared to Llano. 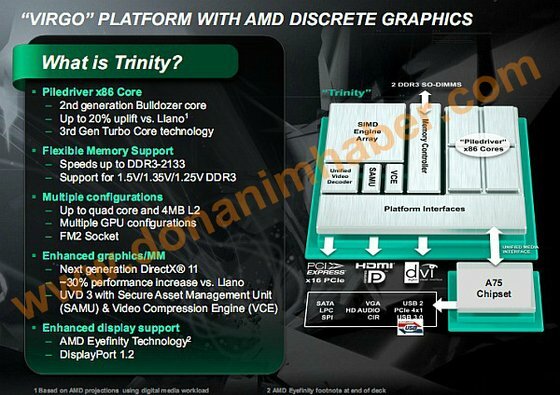 Trinity will feature upto 2 Piledriver modules, which AMD will market as quad-core. The 2 module APU will feature a total of 4MB L2. Not surprisingly, it is hinted that the L3 will be dropped, as the L3 cache was included in Bulldozer for server applications. Like Llano, multiple GPU and asymmetric crossfire will be supported. The GPU will also get a significant boost, moving to the VLIW-4 architecture. Estimated GPU improvement over Llano is expected to be 30%. The new UVD3 features Video Compression Engine (VCE) which is surely a response to Intel's QuickSync.